North Carolina’s controversial and ill-founded House Bill 2 drew another response from one of the nation’s major sports institutions Friday, as the NCAA issued an anti-discrimination survey for all host cities of NCAA events. This comes a day after the NBA declared plans to move the 2016-17 All-Star Game, after repeated public warnings from commissioner Adam Silver. Greensboro is set to host the second and third rounds of March Madness in 2017, while Charlotte will play host to the same rounds in 2018. The move to threaten these events with cancellation is not the first time the NCAA has spoken out against discriminatory legislation. Notably, the NCAA opposed Indiana’s RFRA law—a law that allowed discrimination based on religious views—in 2015, the year the Final Four was held in Indianapolis, where the organization’s national headquarters are also located. The same year, the NCAA held the Elite Eight in Houston, where an ordinance offering protection from transgender discrimination was eventually shot down. Neither event was moved. Today’s survey seemed an attempt to catch such instances prior to the scheduling of all NCAA-related events. The third and fourth items on the questionnaire section made public on the NCAA website are pointed toward House Bill 2 and other similar bathroom bills, which exist across the nation. In addition to the NCAA, college sports’s individual conferences are also having to deal with the HB2 issue. While at this week’s ACC media days, conference commissioner John Swofford told the News & Observer the law will not result in the moving of this year’s ACC Football Championship Game in Charlotte. Swofford said the law will likely affect the ACC’s future plans, but it won’t be until the conference’s October meetings that the school athletic directors have an opportunity to address the matter and the NBA’s decision. “We came out of our spring meetings with our championships decided upon, the sites of those championships, decided upon for the 16-17 (academic) year,” Swofford said. “And with a very strong statement about inclusion and anti-discrimination and concern about the law and obviously that’s still in play as to where that ends up. The law has also forced the cancellation of men’s basketball and field hockey matchups between Duke and Albany, a New York public university that’s travel to Durham was put on ice by a state order that halts all travel to North Carolina that is funded by the public. 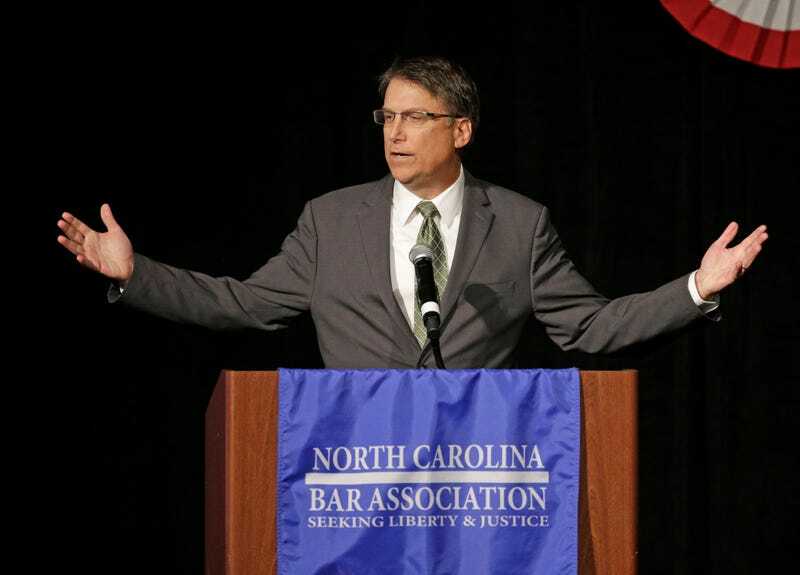 In the meantime, North Carolina governor Pat McCrory spent his morning with a local radio host waxing on about the Orwellian hell he currently finds himself entrapped in. It’s almost, Mike, an Orwellian type of situation in our country in which the thought police are purging anyone who disagrees with their particular political opinion. And in this case, the NBA is purging our state and our city based upon our political democratic process and denying their services based upon our political opinion, which I think is Orwellian. Good times to be had in North Carolina.